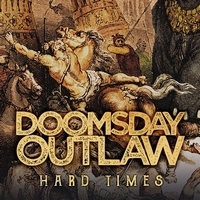 British rockers Doomsday Outlaw presented their debut Suffer More in 2016 on their own, now signed by Frontiers Records they release Hard Times. Hard Times, the title track, is also the opener and kicks off with heavy riffs. Soon the quintet us going full force and drags you into their bluesy, Southern rock-influenced heavy rock universe. With Over And Over they offer a classic rocker with great guitar play by Steve Broughton and Gavin Mills. After a bluesy rocker they surprise the listener with Into The Light, a piano-based ballad. Just beautiful. They are back rocking with Bring It On Home! Quite catchy is Days Since I Saw The Sun, but it's still a rocker with heavy riffs and melodic passages. Next in line is Will You Wait, a 7+ minutes long track which takes you onto a musical journey. The masterpiece of Hard Times! I can recommend this album to fans of heavy rock who like varying sounds woven into the classic / heavy rock. Check out Doomsday Outlaw!